This article is about the car found in GTA San Andreas. For the car in GTA V, see Elegy RH8. An Elegy in GTA San Andreas. The Elegy is a 2-door sports coupe featured in Grand Theft Auto: San Andreas. The Elegy is based off the third generation Nissan Skyline GT-R, which is only sold officially in Japan and is rarely ever seen in the US market. It bears a striking resemblance to the R32 model with R34 taillights, although the front resembles the Skyline R31 GTS-R because the front seems to be more squarer in shape compared to the rounder 4WD Skyline GTR R32. The Elegy is rear-wheel drive, unlike the well known Skyline GT-R, which is all-wheel drive, even though the GTS-t (a lower grade model with less power) is rear-wheel drive. Acceleration, speed, and handling are very impressive, although slight burnouts and fishtailing can be a nuisance while speeding about the city, as the engine tends to overpower the drivetrain, threatening it to spin out if attempting to turn in corners. This also makes the car virtually unmanageable at high speeds after a back tire has been shot out, making it extremely difficult to maintain control. However, it is one of the best cars to to drift with. Despite the small chassis, the Elegy is capable of withstanding a good deal of damage, but explosions and/or Shotguns must be avoided. The Elegy's engine looks and performs very similar to the Sultan's, and is probably also a twin-turbo straight-6. 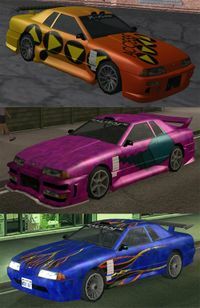 Possible combinations of modifications that can be given to Elegy's at Wheel Arch Angels in GTA San Andreas. Since it is a tuner, the Elegy can only be modified in Wheel Arch Angels in Ocean Flats, San Fierro. 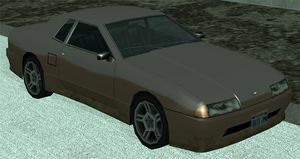 The Elegy is used by the San Fierro Triads as one of their gang cars, alongside the Sultan and the Stratum, which are also both tuners. The default radio station in the Elegy is CSR 103.9. Due to the lower height of its driver's seat, CJ will kick the car's occupant when stealing the car. Usually found around The Strip in Las Venturas or in Downtown San Fierro. Found around San Fierro Triads turfs like in Calton Heights or in Chinatown, both in San Fierro. Found inside the Wang Cars showroom upon completion of Test Drive. Elegy RH8, a more modern version found in Grand Theft Auto V.
This page was last modified on 5 February 2015, at 01:07.